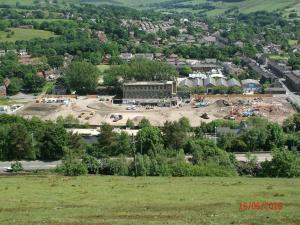 In order to facilitate the development of a new Tesco Supermarket and light industrial unit, the former Wellington Mills were demolished (following identification and removal of asbestos) before a programme of below ground demolition, archaeological exploration, recording and preservation, soil and groundwater remediation, diversion of services, ground improvement and provision of a development platform for the store and units. 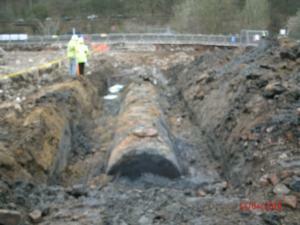 The remediation involved free product recovery, ex-situ biological treatment and groundwater pumping and treatment. A stabilised development platform was provided and a sensitive structure hand demolished and recorded for re-construction. Acting as Principal Contractor and responsible for all works, VertaseFLI followed from the clients consulting engineer on a D&B basis to provide the development platforms working on a lump sum all risk basis. We attained all the relevant permission and permits including organising road closure to facilitate demolition, the removal of telecommunications masts and power connections, working adjacent to a water course, Environmental Permit, notifications of asbestos removal, etc. We acted as Principal Contractor for the works with specialist asbestos and demolition sub-contractors and prepared all the necessary H&S information. All other works including remediation works, treatment of soil contamination, groundwater and ground improvement were undertaken in house. Works were undertaken on a strict programme in advance of store construction and delivered on time and on budget.